A magical realist novel about a neurotic man and his devotion to his beloved, cancer-stricken dachshund. ...reading this heart-wrenching but ultimately breathtaking novel was a very profound experience for me ... There are many things dog people will recognize here — and humor too, from Ted’s list of Lily’s nicknames to his guilt for accidentally hurting her ... The book takes a turn into magical realism when Ted sets out to kill the octopus that’s threatening Lily’s life, but there’s useful reality in how he deals with loss. [A] startlingly imaginative and just as tender debut novel ... The novel’s structure is marvelously idiosyncratic ... Lily gives Edward so many lasting treats. Rowley has done the same. Be prepared for outright laughs and searing or silly moments of canine and human recognition. 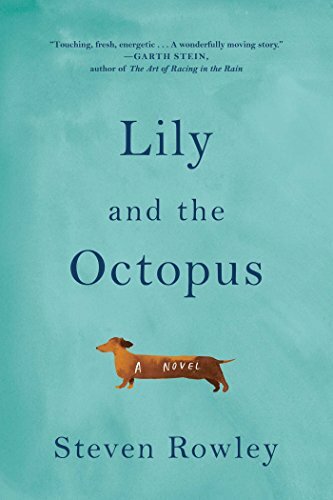 ...[a] bludgeoningly sentimental novel ... there are many ways in which Lily and the Octopus is like observing an exhausting tantrum ... this emotional breakthrough doesn’t feel earned through an organic evolution. Instead the whole octopus business comes across as a coy device, simply the means by which the writer stalls the inevitable breakthrough and death scene with enough padding to make it a book. What did you think of Lily and the Octopus?